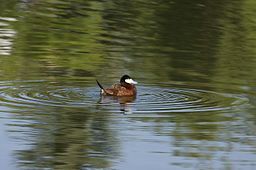 Every spring (and fall) Lake Olander plays brief host to several species of migrating waterfowl. These swimming and diving birds (ducks, grebes, coots and more) use lakes like this one as resting spots while they make their long journeys between their wintering sites in Mexico or the southern U.S. and their breeding grounds in Canada or Alaska. And some of them are here right now!! Just in the past hour, I’ve seen pied-billed grebes, a pair of ruddy ducks, a bufflehead, and a possible horned grebe. 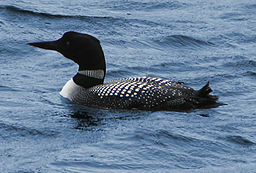 Plus everybody’s favorite Lake O spring visitor… a Common Loon! I got a special treat while I was focusing my spotting scope on the ruddy duck … one of our resident adult Bald Eagles swooped over the lake right in front of me. It was carrying a bird in its talons! The eagle carried its prey across the lake a couple times before finally settling right by the playground to finish eating its dinner. What a sight. This week is a great time to come check out all sorts of birds at Olander Park!